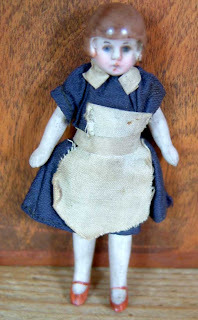 I currently have a variety of antique dolls available on KT Miniatures and thought I would show you a selection on here. 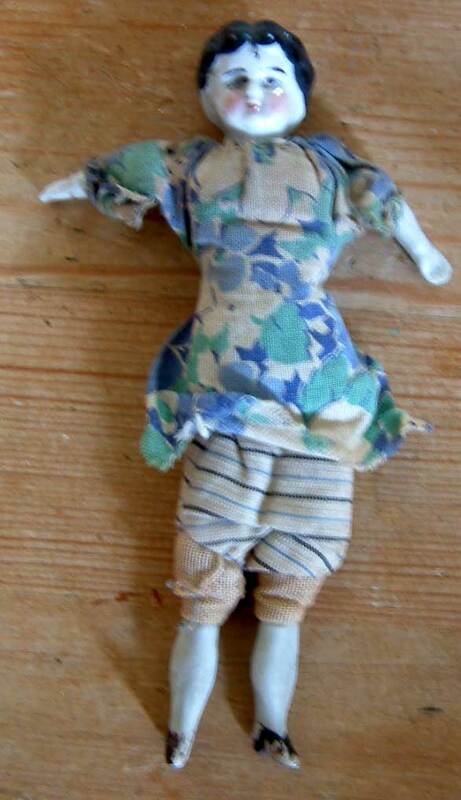 This first doll is extremely old and believed to be late Victorian. She has a china head plus bisque arms and legs, the rest of her body is made from stuffed material. Her clothes are believed to be original and although she is a little playworn, she is still exquisite. She measures 5" in height and would look wonderful in an old dolls house. It is refreshing to have the whole doll as more often than not I end up with just the head or maybe an occasional limb from this type of doll! There are also two bisque Kewpie type dolls, both identical, each complete with their own nursery bed and are being sold separately. They are real cuties measuring just 2 1/2" in height and are believed to be either German or Japanese, dating from c1930s. Both are a little playworn and a tad grubby but generally are in good condition. This particular German bisque doll is one of my all time favourites and she is in an excellent played with condition, c1920s/1930s. As you can see she is dressed as a maid, her clothes being original and she has gorgeous painted features including her little shoes and bobbed hair. She measures 3 1/4" in height. Isn't she lovely? I am so torn to let her go but already have three in my little 30's Hobbies House so go she must as it is becoming rather crowded in there! 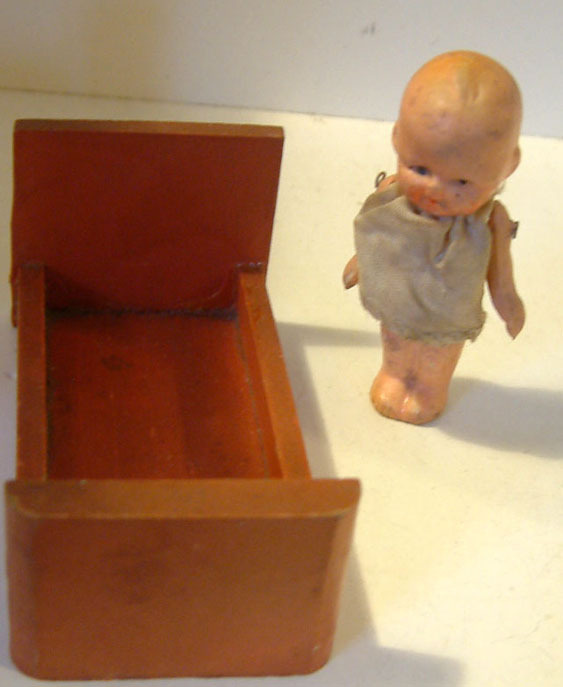 There are other vintage dolls including a couple of little Grecons currently for sale. 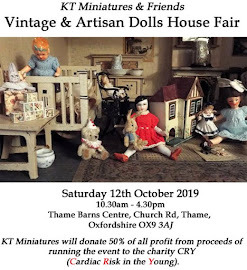 I am in the process of putting up for sale on KT Miniatures some quite old and interesting dolls house furniture, all from the same vintage collection. 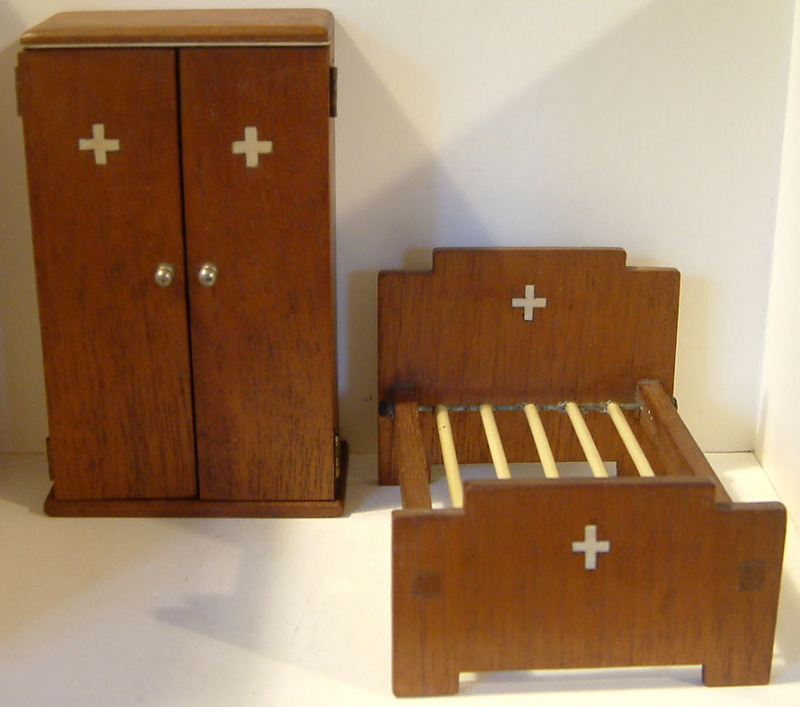 My favourite of all the pieces that I have listed today is this little bedroom set that has been inlaid with bone in a cross design...it is quite exquisite and beautifully crafted. The wardrobe doors open to reveal a little mirror and two tiny hangers on a rail....absolutely wonderful! The wardrobe measures 6 3/4" high x 4" wide x 2 1/4" deep so quite big for 1/12th scale. Here you can see the inlay detail of the bone, it has been quite skillfully created. Wonder if there is some significance of the cross? The bed measures 6" long x 4 1/4" wide and is sprung with vintage covered curtain rail rods.....truly delightful. I am of the opinion that although there is no makers mark, this set was probably manufactured commercially circa 1920s/1930s in Europe (the design of the bed suggests the art deco era). There is no doubt that this is a quality set and would look fantastic in an old dolls house. Obviously if anyone out there has seen a set like this before or can even shed some light on the maker, I would love to hear from you. 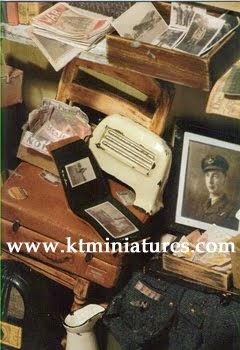 It is now up for sale under the Antique 1/12th Bedroom section on KT Miniatures. 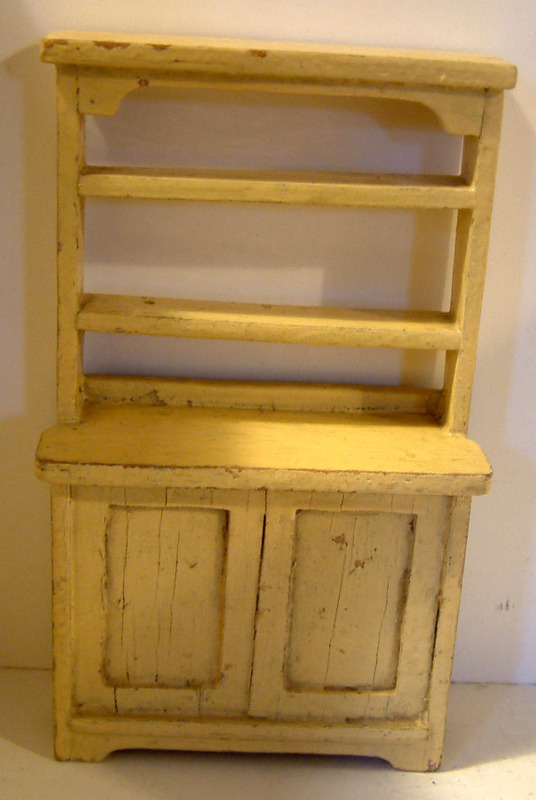 Here are two other old pieces from the same vintage collection that have been listed today. A very old wardrobe circa 1910-1920s with a lovely mirrored door. 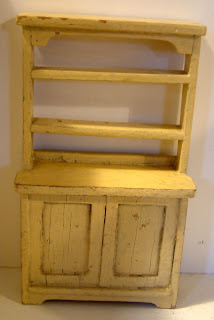 Plus a kitchen dresser from the same era (in fact it may even be late Victorian). The old wardrobe can be found on the same page as the bedroom set above and the old dresser can be found on the Antique 1/12th Kitchen Page. 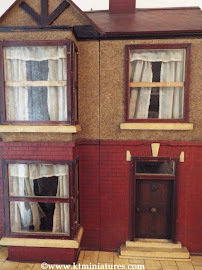 There are lots more interesting vintage dolls house pieces to go up for sale over the next few days, all from the same collection. 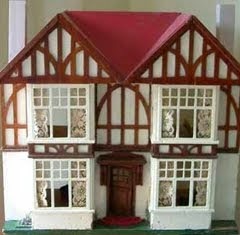 This adorable little dolls house has just gone up for sale today on KT Miniatures website. It is handmade and believed to have been created for a little girl called Susan in the 1950s. There are some really nice touches to this house with much of the original handmade furniture (all included in the sale). I love the little round window at the top of the house which looks into a loft room and the way the chimney has been designed as a handle! My favourite room has to be the bedroom as it still retains it's original handmade bed with bedclothes, dressing table with pull out drawers. A REALLY LOVELY touch.....a built in wardrobe with sliding door. Inside there is still a felt coat on a hangar.....gorgeous! The kitchen is a bit of a mix. I think the shelf with hooks is original but the sink and cooker are plastic and different scale ie. more like 1/16th whereas the other furniture is more like 1/12th scale. So I believe these are later additions. The lounge has a wonderful embroidered carpet that sets off the two handmade armchairs and table, all original to the house. Another really lovely touch is the loft rooms, accessed by a lift off back roof panel....clever! I have just returned from a very special book signing of a lovely lady who I have had the privilege to know for several years now. I am sure she will not mind me telling you that she is just 79 years young! 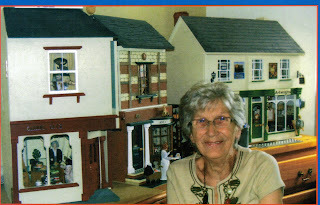 The lady in question is called Hazel Bleay and she has been a member of the Thame dolls house club (MTM) for quite some time. It was when Hazel began to create a miniature version of The Cadena (a cake shop and cafe that was situated in Oxford but now long gone ) that she found the inspiration to write an entire book on the old shops of Oxford. 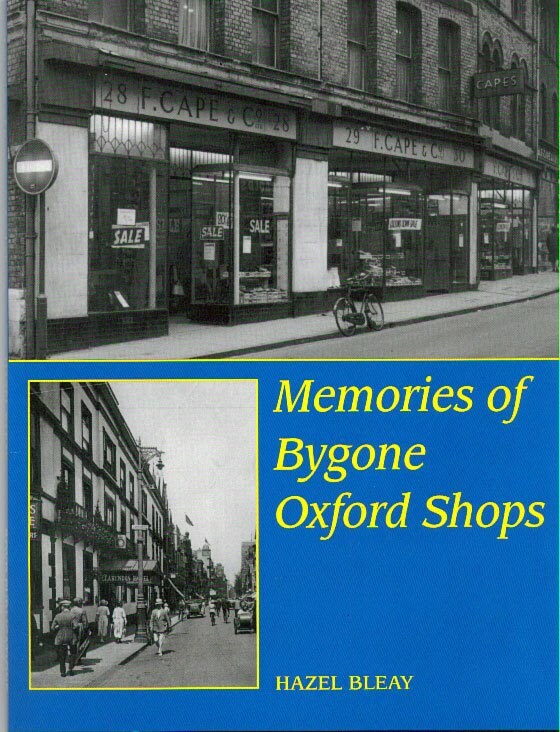 At last Memories Of Bygone Oxford Shops has now been published and is available to purchase (see details below). Hazel was born and bred in Oxford and is quite a character, as anyone who knows her would agree! Her book is purely based on her own very special memories. Whether you know Oxford or not, I am sure you will find this book fascinating as it is oozing with black and white photographs of wonderful old shops as they appeared over many decades. 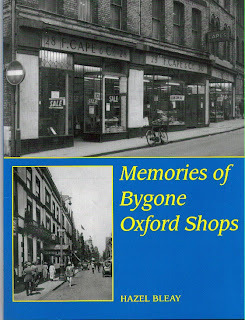 Memories Of Bygone Oxford Shops, is priced @ £9.95, published by Robert Boyd Publications of Witney and is now for sale at Blackwells in Broad Street, Oxford and both Oxford and Thame branches of Bookhouse. I have recently put up for sale on KT Miniatures website a wonderful vintage miniature version of a Hoover Model 262 vacuum cleaner. 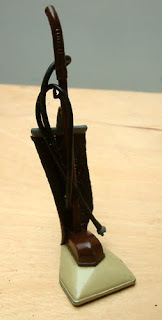 It is an upright model and comes complete with the original flex and two pin plug on the end....fantastic! On the base of the model there is an abundance of helpful markings and apparently this miniature vacuum cleaner was made in England by a company called DCA. 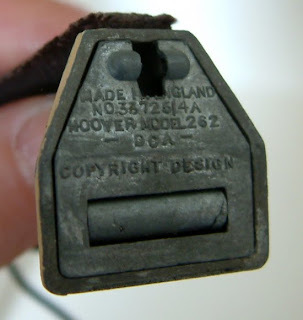 A quick search on Google reveals that this particular 262 model (the real life sized one) was first made in 1939 then produced again after the war by Hoover from 1945 to 1949. To be honest, I have seen this particular miniature vacuum cleaner before and always assumed that it originated from the 1950s. 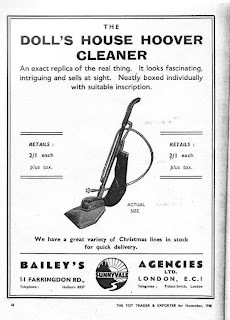 But an advert that was kindly forwarded to me by Marion Osborne, shows that this miniature upright version of the Hoover 262, although made by DCA, was actually being sold in 1948 by a company called Bailey’s Agencies of 51 Farringdon Road, London EC1. 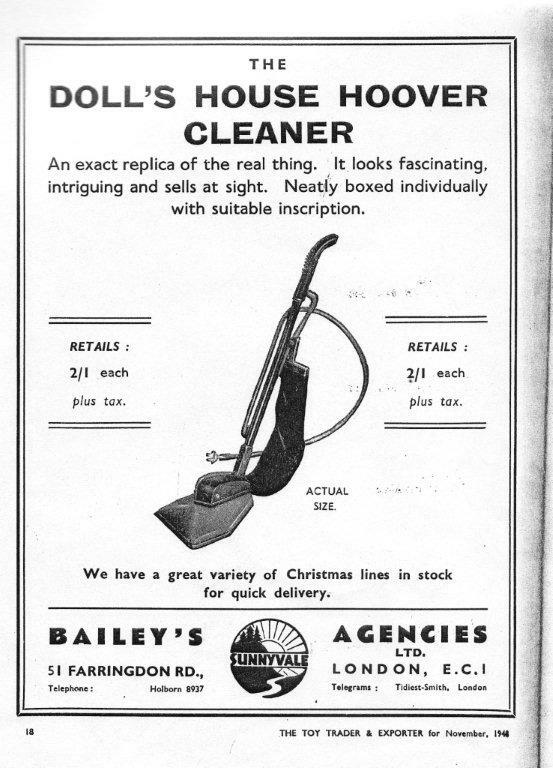 As you can see from the old advert, the little hoover was being sold for just 2/1d! The only piece of information that I have been able to find out about Bailey’s Agencies is that it no longer appears to be in existence at that address.....and that no 51 Farringdon Road is now a cafe. I have also endeavoured to find out more about this DCA company but sadly to no avail. The only other known dolls house size item to my knowledge made by DCA, is a Jones Sewing Machine. To date, I have never been able to lay my hands on one of those and have only ever admired from afar....they are like gold dust and more valuable than the vacuum cleaner! Does anyone have any information about the DCA company or even Bailey’s Agencies that you can share with us on here? (I can't even find out what the initials DCA actually stand for). Also, other than the vacuum cleaner and sewing machine, does anyone know of anything else that DCA made for dolls houses?